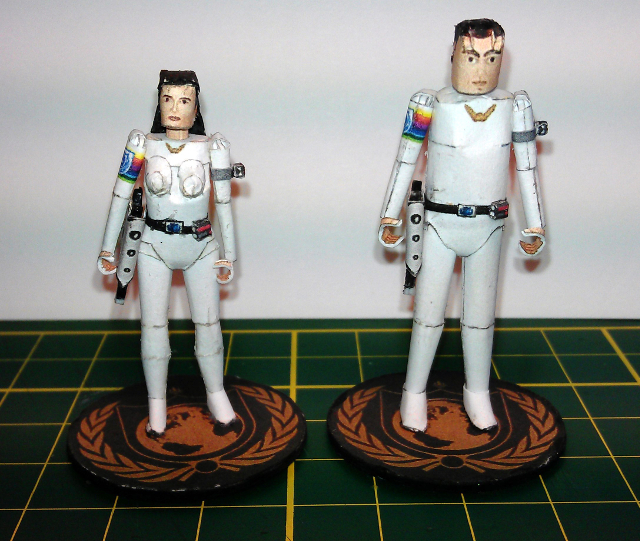 A talented modeler, Christopher Tucker (Rhaven Blaack), has once more taken it upon himself to repaint my Paper Protagonist figurines, adding elements to suit the Original Series Battlestar Galactica uniforms for the Viper Pilots. He has included the helmet and equipment, designed by fellow modeller, Marcell von dem Berge (Revell-Fan). As well, the helmets have a logo selection between the Galactica and the Pegasus. It looks fantastic, and I am very happy to see this fan mod. The files can be found in the Figures section of the site, under the Protagonist header. 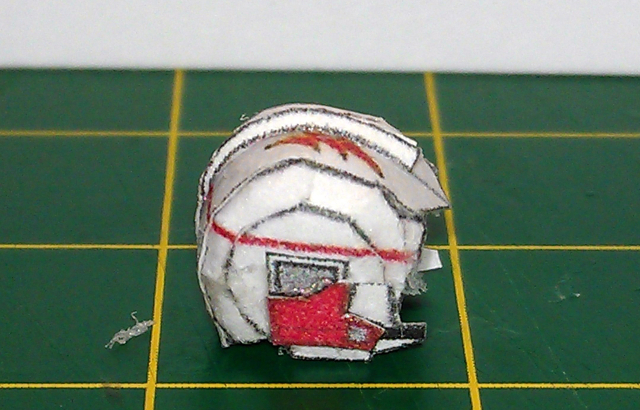 He has included a helmet, redesigned by fellow modeller, Marcell von dem Berge (Revell-Fan). It looks fantastic, and I am very happy to see this fan mod. The files can be found in the Figures section of the site, under the Protagonist header. This set was started months ago, and was, in all honesty, ready for layout before Christmas. I will admit to being distracted with life. However, at long last it is ready. My initial intent was to include vehicles, but that will have to be a supplemental set. The roads are designed at 1:1000 scale, and are laid out in a Hex grid (standard 32 mm). The sections are designed to fit nicely together and include X and Y crossings (on the Hex edge) as well as 90 Degree crossings to allow for a more natural looking roadway. I will (eventually) be releasing a second set which will allow for a seamless fit between the Road and Train sets. 1:270 scale X-Wing is now released! Full disclosure, I have not (yet) built one of these, and the complexity is a step (or so) beyond the TIE Fighters in the same scale. I am confident that they will assemble well, however. I'll post any changes I make after I have built one. I have released these with a 'blank' texture so that you can modify and add markings as you please. Updates have been terribly slow, for which I apologize. Life has mostly taken me in hand this last year, and I've had little time or inclination to model or maintain the site, beyond renewing my hosting and IP. That said, the last posted update went missing, and while I took the time to reupload the files, I did not take the time to rewrite the post, so some of the newer visitors may have missed the update. I designed, back in the fall, 1:270 models to compliment the Fantasy Flight X-Wing miniatures game. Currently the models are limited to the TIE fighter, the TIE Interceptor and the TIE Defender, although I do have plans to eventually extend the line. Some sample shots are below, and the models are available in the Vehicles section. Now available: 3D 1:1000 Hex Forest Markers. Designed with Tabletop Battletech in mind, these markers represent trees 12-15 meters in height at 'map scale', or near 1:1000. These trees allow you to place 1:1000 or regular 1:285 scale Battlemechs (or other figures) within the hex, while yet retaining the look of a 3D forest. Find these in the Hex terrain section. As an aside, through designing this set, I've come to realize that my internal guide for 'levels' in Battletech was off. I was estimating 10 meter levels, rather than the standard of 6 meters. Future releases will reflect this leveling change, and expect that the Hex Hills set will receive an update. Soon to come: 1:1000 Roads. City walls are now released, you can find the files in the Hex Terrain section. 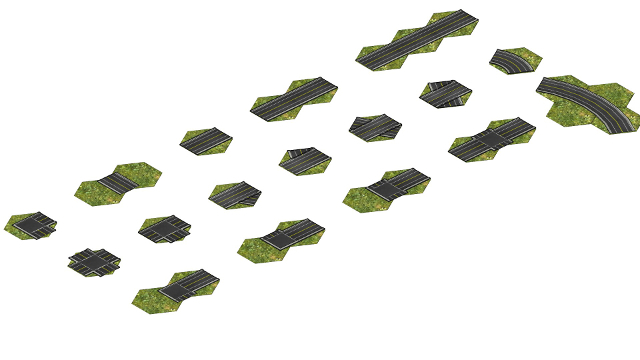 This is a part of a larger set that will include both roads and modualr buildings.